Chronic obstructive pulmonary disease (COPD) and asthma are common respiratory diseases which place an enormous economic, social, and healthcare burden on the United States and worldwide . COPD is a major cause of morbidity and mortality, and is predicted to be the third leading cause of death worldwide by 2030 . In 2000, COPD was responsible for 726 000 hospitalizations and 1.5 million emergency department visits in the United States . According to US estimates for 2010, COPD was responsible for approximately US $49.9 billion in direct and indirect costs . Furthermore, COPD is the only leading cause of death in the United States for which the death rate is not improving (Fig. 1) . 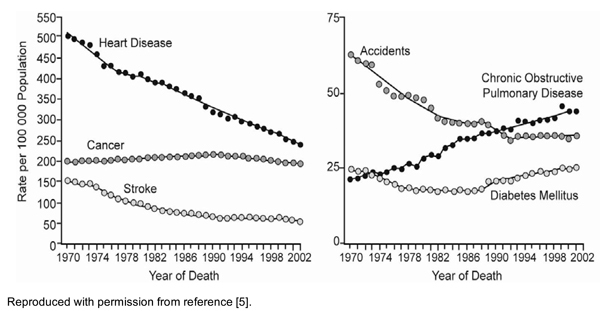 Trends in standardized death rates for the six leading causes of death in the United States, 1970–2002. Akin to COPD, asthma is a complex disorder, which has increased in incidence over the past several decades and currently affects ~300 million people worldwide . In 2008, 23.4 million people had a confirmed diagnosis of asthma in the United States, including 7 million children , while ~58 000 individuals were hospitalized because of asthma in 2007 . Both asthma and COPD are characterized by airflow obstruction and chronic persistent airway inflammation. Many patients with asthma or COPD have similar characteristics — an overlap that often makes it difficult to diagnose accurately either condition . Although the clinical presentations of COPD and asthma are similar, each disease has different pathological mechanisms and therapeutic strategies. Therefore, early detection and differential diagnoses are essential to ensure that appropriate treatment is offered to promote optimal lung function. Given the high incidence of these respiratory diseases worldwide, healthcare personnel such as nurse practitioners (NPs) are at the forefront of diagnosing, managing, and differentiating between COPD and asthma. This article describes differences in treatment strategies and the techniques to distinguish between the two diseases. The American Thoracic Society (ATS)/European Respiratory Society (ERS) and the Global Initiative for Chronic Obstructive Lung Disease (GOLD) guidelines define COPD as a preventable and treatable disease usually characterized by progressive airflow limitation and is associated with an abnormal inflammatory response of the lungs to noxious particles or gases, primarily caused by cigarette smoking [4, 6, 10]. Exposure to air pollutants, a rare genetic disorder involving a deficiency of the enzyme α-1 antitrypsin, poor nutrition, and low socioeconomic status have also been associated with COPD , but the vast majority of cases of COPD in the United States are caused by cigarette smoking. In 2006, an estimated 20.8% (45.3 million) of US adults were current cigarette smokers and a total of 41% (91 million) were “ever smokers” (i.e. had smoked at least 100 cigarettes during their lifetime) . More strikingly, the number of US women who smoked tripled between 1980 and 2000. This is reflected in the distressing fact that, for the first time in history, women are now dying more frequently than men from COPD . Symptoms of COPD generally develop slowly during midlife, but often are not recognized until they have become chronic and disabling. Patients with COPD commonly experience an aggregate of symptoms including exertional dyspnea, chronic cough, sputum production, and wheezing. In mild COPD, patients may experience only breathlessness during high-energy activities, such as exercise. As the disease worsens, patients become breathless during normal daily activities and tend to avoid situations that cause shortness of breath, thereby entering a downward spiral of muscle deconditioning and worsening lung function . Asthma affects people of all ages worldwide. It is a chronic inflammatory disease of hyper-reactive airways which has a number of trigger factors, such as exposure to allergens, including mold, animal dander, pollen, dust mites, occupational irritants, pulmonary bacterial and viral infections, stress, and exercise . Unlike COPD, for many patients, asthma has its roots in infancy and manifests as a constellation of symptoms in both children and adults. Unlike COPD, reasons for asthma development are relatively unknown; however, a family history of asthma can predispose an individual to this disease. Furthermore, ~10% to 15% of new-onset asthma in adults is attributable to occupational exposure . In occupational asthma, airway hyper-reactivity is caused by exposure to substances such as vapors, dust, fumes, and organic material in the workplace. This is differentiated from patients who have pre-existing asthma that is triggered by occupational hazards, which may lead to lung damage that is not recognized until years after the exposure . Asthma has such a wide spectrum of predisposing factors and clinical presentations that there is no uniform classification. The clinical symptoms of asthma include varying degrees of wheezing, shortness of breath, coughing, and chest tightness. Asthma can be episodic, and these symptoms can occur or worsen at night or early in the morning . COPD and asthma have several differentiating factors (Table 1)  which can be useful during diagnosis. Documenting a patient’s medical history, physical examination, and diagnostic tests can aid the healthcare practitioner to distinguish between the two diseases. a Adapted with permission from the Global Initiative for Chronic Obstructive Lung Disease (GOLD) . Medical history taking should contain information on the patient’s smoking history, medication profile (including allergies to specific medications), allergies to risk factors for asthma (e.g. pollen or animal dander), comorbidities, surgical history, sleep apnea, recurring respiratory infections, colds that last weeks instead of days, any childhood illnesses, and a family history of α-1 antitrypsin deficiency, asthma, or atopic disease. Documentation of occupational history is also important, as both COPD and asthma can be caused by exposure to noxious gases or particles . Questionnaires may also help NPs to identify patients who require further testing to confirm COPD [4, 16] or to differentiate between COPD and asthma [17, 18]. The patient’s general appearance and breathing pattern may suggest clues to the later stages of COPD. Subtle clues begin with observing the patient, specifically looking for an increased chest diameter as manifested by an increase in the anterior–posterior thoracic dimension or an elevation of the sternal notch which gives the appearance of a shortened neck. A focused respiratory system inspection continues by noting the patient’s posture, respiratory rate (including depth, rhythm, symmetry, and use of accessory muscles during respiration), active abdominal muscle expiratory efforts, discoordinate thoraco-abdominal motion, and clubbing of the fingers. The lungs should be percussed to detect hyper-resonance and equality, and then auscultated to distinguish distant breath sounds, wheezing, decreased air exchange, or crackles which occur very early in the inspiratory cycle in patients with COPD. Moreover, detailed attention should be paid to the cardiac system, including assessment of heart rhythm and circulation, and a search for jugular vein distension, chest wall abnormalities, central cyanosis, and peripheral edema [19, 20]. It should be noted that during milder stages of COPD, physical examination is often normal and as a result it is difficult to distinguish between asthma and COPD exclusively on the basis of physical examination. The physical examination of a patient with asthma is distinctly different from a patient with COPD. Unless the patient is experiencing an exacerbation, the examination is often normal, with none of the chronic signs noted above for patients with COPD. During an exacerbation, overt wheezing (expiratory more pronounced than inspiratory) is the most prominent sign, but hyperinflation and accessory muscle use can be seen as the condition worsens . Spirometry, which measures both forced expiratory volume in 1 second (FEV1) and forced vital capacity (FVC), is necessary to confirm the diagnosis of COPD and asthma, and to differentiate the two disorders, as well as to determine disease stage and guide the treatment plan. Both the ATS/ERS and GOLD guidelines use a simple classification of COPD based on a post-bronchodilator FEV1/FVC ratio of less than 0.70 . This ratio suggests a diagnosis of COPD, provided the patient’s clinical history, symptoms, and risk factors point to a high probability of the diagnosis, and the post-bronchodilator FEV1 does not improve to “normal” (demonstrating airflow limitation that is not fully reversible) [4, 22]. If the post-bronchodilator FEV1 improves to normal (i.e. greater than 80% of predicted based on the patient’s age, gender, and height, and modified by ethnic background), this points more towards a diagnosis of asthma. In most patients with asthma, the FEV1/FVC ratio also returns to normal after bronchodilator use. According to the Global Initiative for Asthma (GINA) guidelines, the degree of reversibility in FEV1 indicative of an asthma diagnosis is usually accepted as 200 ml and 12% above the pre-bronchodilator value . If asthma is suspected but spirometry is normal, asthma can be confirmed by measuring airway responsiveness to exercise challenge or to airway challenges, such as with mannitol, methacholine, or histamine. Measurements of allergic status (e.g. skin tests with allergens or in vitro tests) can also be used to suggest asthma . Other testing for COPD includes: imaging, such as chest x-ray and computed tomography (although, neither are recommended for routine diagnosis); lung volumes and diffusing capacity; oximetry and arterial blood gas measurement for patients with FEV1 less than 35%; α-1 antitrypsin deficiency screening for patients less than 45 years old with signs and symptoms of COPD; exercise testing; or composite scores that encompass a number of these variables . Healthcare practitioners should also recommend chest radiography to rule out any type of pulmonary infection, cardiac disease, lesion, or mass. COPD and asthma can co-exist in some patients; this is highlighted by a study of patients in the United States and United Kingdom, which showed that 17% to 19% of patients with obstructive airway diseases had an overlap of conditions . In such patients, it is not possible to differentiate COPD and asthma using the current diagnostic tools . Patients with co-existing COPD and asthma remain poorly recognized in clinical practice and this overlap syndrome has been associated with poor health-related quality of life . Treatment of both COPD and asthma should commence with patient education on disease outcomes, treatment options, and risk factors of their disease, such as smoking for COPD and allergens (e.g. pollen) for asthma. Since smoking can trigger exacerbations in patients with COPD or asthma, smoking cessation will help in the optimal management of both diseases . It has been observed that ex-smokers with COPD have a significantly reduced risk of exacerbations compared with current smokers (adjusted hazard ratio 0.78; 95% confidence interval: 0.75, 0.87) . In addition, the GINA guidelines list smoking cessation among the risk factor reduction measures that can improve asthma control and reduce medication needs . While COPD and asthma share many treatment options, the approach to pharmacotherapy for the two conditions differs, with the emphasis on bronchodilators in COPD treatment and anti-inflammatory agents in asthma treatment [4, 6]. COPD can be managed through pharmacologic and non-pharmacologic treatment regimes. The GOLD guidelines recommend pharmacotherapy based on disease severity, with medications added in a step-wise and cumulative manner as the disease severity increases . Pharmacologic agents most commonly used to manage the disease are bronchodilators (β2 agonists and anticholinergics) and corticosteroids (inhaled and oral). Symptom relief can be achieved with short-acting β2 agonists (SABAs; e.g. albuterol) as needed during all stages of the disease . Other bronchodilators, such as long-acting β2 agonists (LABAs; e.g. formoterol, indacaterol, and salmeterol), short- and long-acting anticholinergics (e.g. ipratropium and tiotropium, respectively), and combinations of these agents (e.g. albuterol + ipratropium) are prescribed for the long-term management of COPD. Inhaled corticosteroids (ICS), such as fluticasone and budesonide, are recommended as an add-on therapy to long-acting bronchodilators in patients with severe or very severe COPD and a history of repeat exacerbations. Other pharmacologic therapies include methylxanthines and phosphodiesterase-4 inhibitors. The GOLD guidelines state that methylxanthines (e.g. slow-release theophylline) can be used when there is not a sufficient response to short-acting bronchodilators; however, these agents are “non-selective inhibitors of all phosphodiesterase enzyme subsets, which explains their wide range of toxic effects” . Roflumilast, an oral phosphodiesterase-4 inhibitor, has been approved by the US Food and Drug Administration (FDA) as a treatment to reduce the risk of exacerbations in patients with severe COPD associated with chronic bronchitis and a history of exacerbations . Oxygen is an additional, central treatment for patients with very severe COPD and can be given to individuals to relieve acute breathlessness. Alternatively, oxygen may be used continuously or administered during exercise . Long-term oxygen use (greater than 15 hours per day) has been shown to enhance quality of life and increase survival in patients with advanced COPD and chronic hypoxemia . Several non-pharmacologic treatment options are available for COPD management. These include smoking cessation and pulmonary rehabilitation (PR). Ventilatory support and surgical treatments are additional non-pharmacologic treatments which can be considered in selected cases . Since COPD development and its exacerbations are linked to cigarette smoking , smoking cessation programs can be extremely important in delaying progression of the disease. NPs can play a key role in motivating patients to quit smoking by educating them on the risk factors for COPD and providing a supportive environment for patients to discuss any issues related to these programs. Pulmonary rehabilitation is a well-established therapy which can improve symptoms, optimize functional status, and reduce healthcare costs . The goal of PR is to address non-pulmonary issues, particularly in patients with moderate to very severe disease which may not be fully treated with pharmacotherapies. These issues include mood changes (e.g. depression), muscle atrophy, weight loss, and exercise deconditioning. A comprehensive PR program should include exercise training, nutrition counseling, and patient education . PR is considered by most guidelines to be the standard of care [4, 10, 28] and should therefore be offered to all patients with COPD. The GINA guidelines  recommend the use of controller drugs, such as ICSs, as the preferred treatment for persistent asthma. A combination of an ICS and a LABA, such as budesonide + formoterol, may also be used as a controller medication, but monotherapy with LABAs is contraindicated for patients with asthma because these drugs can increase the risk of serious exacerbations and death ; however, this recommendation does not apply to the use of LABAs in COPD, where these agents are frequently used as maintenance therapy. Other asthma controller medications include leukotriene modifiers (e.g. montelukast) and sustained-release theophylline. Leukotriene modifiers may be used in patients who experience side effects or who are unable/unwilling to use an ICS; they may be particularly helpful for patients with aspirin-intolerant asthma . Similarly, sustained-release theophylline may be used as an add-on therapy in patients who are unable to control their disease with an ICS; however, its use has been associated with a range of side effects in patients. Sodium cromoglycate and nedocromil sodium may also have a limited role as asthma controllers in selected patients and, unlike theophylline, these cromones have a favorable safety profile . Patients with refractory or difficult-to-treat asthma consume a substantial proportion of healthcare resources through emergency department visits, hospital admissions, and number of consultations . Pharmacotherapies that target immunoglobulin E, a key mediator in molecular pathways involved in allergic responses, can be used to manage individuals with severe, persistent disease . Omalizumab, an anti-immunoglobulin E monoclonal antibody, may be prescribed in the United States for asthma patients with “moderate to severe persistent disease who have a positive skin test or in vitro reactivity to a perennial aeroallergen and whose symptoms cannot be adequately controlled with an ICS” . However, the FDA has issued a black box warning for anaphylaxis beginning as early as after the first dose or beyond 1 year after initiating regularly administered treatment with this drug . Therefore, healthcare practitioners should monitor patients for symptoms of anaphylaxis after an omalizumab injection. A recent double-blind crossover study involving 210 patients with asthma, who were poorly controlled with an ICS alone, showed that the addition of tiotropium bromide was clinically equivalent to the addition of a LABA; however, tiotropium is currently not approved by the FDA for the treatment of asthma in the United States . A second set of medications called relievers are used “as needed” in case of an asthma exacerbation. The drugs of choice for this purpose are SABAs, although short-acting anticholinergics or short-acting theophylline (e.g. amino-phylline) may be used in case of intolerance to SABAs . The value of short-acting theophylline in relief of asthma symptoms is controversial, but the GINA guidelines state that this medication may benefit respiratory drive . Patients who cannot clearly be typed as having COPD or asthma should be assumed to have co-existing diseases and managed as patients with asthma . Since respiratory infections can trigger exacerbations in both COPD and asthma, influenza vaccination is recommended for both diseases [4, 6]. Furthermore, pneumococcal vaccine is recommended for all patients with COPD aged 65 years or older and for those aged less than 65 years with very severe COPD . Differentiating COPD from asthma has prognostic as well as significant therapeutic implications; for example, misdiagnosis of COPD as asthma can lead to prescription of ICS therapy, which is only recommended in combination with a bronchodilator for patients with severe and very severe COPD or for those with a history of exacerbations. Integrated care intervention involving NPs and other primary care practitioners can improve education and treatment adherence among patients . Since healthcare personnel, such as NPs, play a vital role in diagnosing and managing patients with COPD and asthma, those with a comprehensive understanding of the diagnostic and therapeutic differences between the two diseases can help to lower the risks of exacerbations and hospitalizations, and improve the quality of life of these patients. The authors were fully responsible for all content and editorial decisions, were involved at all stages of manuscript development and have approved the final version of the review that reflects the authors’ interpretation and conclusions. Medical writing assistance, supported financially by Boehringer Ingelheim, was provided by Radhika Bhatia, PhD, of Envision Scientific Solutions during the preparation of this article. Boehringer Ingelheim was given the opport-unity to check the data used in the manuscript for factual accuracy only. Mannino DM, Braman S. The epidemiology and economics of chronic obstructive pulmonary disease Proc Am Thorac Soc 2007; 4: 502-6. Jemal A, Ward E, Hao Y, Thun M. Trends in the leading causes of death in the United States, 1970-2002 JAMA 2005; 294: 1255-9. Pleis JR, Lucas JW, Ward BW. Summary health statistics for U.S. adults: National Health Interview Survey, 2008 Vital Health Stat 2009; 10: 1-157. Niska R, Bhuiya F, Xu J. National Hospital Ambulatory Medical Care Survey: 2007 emergency department summary Natl Health Stat Report 2010; 1-31. Yawn BP. Differential assessment and management of asthma vs chronic obstructive pulmonary disease Medscape J Med 2009; 11: 20. Celli BR, MacNee W, Agusti A, et al. Standards for the diagnosis and treatment of patients with COPD: A summary of the ATS/ERS position paper Eur Respir J 2004; 23: 932-46. Centers for Disease Control and Prevention (CDC). Cigarette smoking among adults-United States. 2006 MMWR Morb Mortal Wkly Rep 2007; 56: 1157-61. Mannino DM, Homa DM, Akinbami LJ, Ford ES, Redd SC. Chronic obstructive pulmonary disease surveillance-United States 1971-2000 MMWR Surveill Summ 2002; 51: 1-16. Mapp CE, Boschetto P, Maestrelli P, Fabbri LM. Occupational asthma Am J Respir Crit Care Med 2005; 172: 280-305. Tarlo SM, Balmes J, Balkissoon R, et al. Diagnosis and management of work-related asthma: American College Of Chest Physicians Consensus Statement Chest 2008; 134: 1S-41S. Martinez FJ, Raczek AE, Seifer FD, et al. Development and initial validation of a self-scored COPD Population Screener Questionnaire (COPD-PS) COPD 2008; 5: 85-95. Beeh KM, Kornmann O, Beier J, Ksoll M, Buhl R. Clinical application of a simple questionnaire for the differentiation of asthma and chronic obstructive pulmonary disease Respir Med 2004; 98: 591-7. Tinkelman DG, Price DB, Nordyke RJ, et al. Symptom-based questionnaire for differentiating COPD and asthma Respiration 2006; 73: 296-305. Tokuda Y, Miyagi S. Physical diagnosis of chronic obstructive pulmonary disease Intern Med 2007; 46: 1885-91. Stephens MB, Yew KS. Diagnosis of chronic obstructive pulmonary disease Am Fam Physician 2008; 78: 87-92. Sharafkhaneh A, Lan C, Goodnight-White S, Hanania N. Early recognition and diagnosis Fed Pract 2008; 25: 4-5. Soriano JB, Davis KJ, Coleman B, Visick G, Mannino D, Pride NB. The proportional Venn diagram of obstructive lung disease: two approximations from the. United States and the United Kingdom Chest 2003; 124: 474-81. Kauppi P, Kupiainen H, Lindqvist A, et al. Overlap syndrome of asthma and COPD predicts low quality of life J Asthma 2011; 48: 279-85.
 van der Molen T, Østrem A, Stallberg B, Østergaard MS, Singh RB. International Primary Care Respiratory Group (IPCRG) Guidelines: management of asthma Prim Care Respir J 2006; 15: 35-47. Au DH, Bryson CL, Chien JW, et al. The effects of smoking cessation on the risk of chronic obstructive pulmonary disease exacerbations J Gen Intern Med 2009; 24: 457-63. Fabbri LM, Calverley PM, Izquierdo-Alonso JL, et al. Roflumilast in moderate-to-severe chronic obstructive pulmonary disease treated with longacting bronchodilators: two randomised clinical trials Lancet 2009; 374: 695-703. Ries AL, Bauldoff GS, Carlin BW, et al. Pulmonary rehabilitation: Joint ACCP/AACVPR evidence-based clinical practice guidelines Chest 2007; 131: 4S-42S. Sin DD, McAlister FA, Man SF, Anthonisen NR. Contemporary management of chronic obstructive pulmonary disease: scientific review JAMA 2003; 290: 2301-12. Dahlén SE, Malmström K, Nizankowska E, et al. Improvement of aspirin-intolerant asthma by montelukast, a leukotriene antagonist: a randomized, double-blind, placebo-controlled trial Am J Respir Crit Care Med 2002; 165: 9-14. Godard P, Chanez P, Siraudin L, Nicoloyannis N, Duru G. Costs of asthma are correlated with severity: a 1-yr prospective study Eur Respir J 2002; 19: 61-7. Sandström T. Omalizumab in the management of patients with allergic (IgE-mediated) asthma J Asthma Allergy 2009; 2: 49-62. Peters SP, Kunselman SJ, Icitovic N, et al. Tiotropium bromide step-up therapy for adults with uncontrolled asthma N Engl J Med 2010; 363: 1715-26. Garcia-Aymerich J, Hernandez C, Alonso A, et al. Effects of an integrated care intervention on risk factors of COPD readmission Respir Med 2007; 101: 1462-9.